Spring is here, and we can feel it around. The parks and mountains look greener, and some of us are sneezing and hiding from the pollen. I found that the natural element is critical to complement most of our projects. I love the touches that nature brings to our homes, you don’t need a garden or having a fantastic landscape to look through your window to convey the nature inside. Even if you are not a plan person, there are plants so resistant that will stay with you for a long time. You can use small plants in decorative pots, easy to move around. They add a perfect organic touch to any surface. The olive tree with hand made glass vases adds the organic touch to this hallway. The plant tree complements the bedroom decoration. The dwarf red Japanese Maple gave us the color splash in this bathroom. Just some vases with greenery around the room balance the color and bring a decorative element to the room. We played a lot with green moss as a decorative element. It can be a leaving moss that requires mist and care or an artificial moss that stays green an doesn’t need any attention. Big natural moss frame for a staircase opening in San Francisco by The Gardenista. Installation for a store that works as a space divider. Frame with smaller and more uniform moss. Just adding the green touch to the foyer. Some spaces allow for thinking out the box, and I always enjoy coming with new solutions. This big column in a high-rise building was perfect for a custom planter. We designed it, and Studio Becker made it. Floating staircases that provide the perfect spot for a built-in planter. Zen garden under the staircase. It is incredible how much a green floor can change a balcony look. We added this artificial turf from Synlawn over the concrete floor in our project in one of our projects in Pacific Avenue. The material has its own drain system, so the material resists raining as well as any other weather condition. And you don’t need to worry about mowing and watering. We complemented the balcony with B&B Italia Butterfly Sofa designed by Patricia Urquiola and planters from CB2. 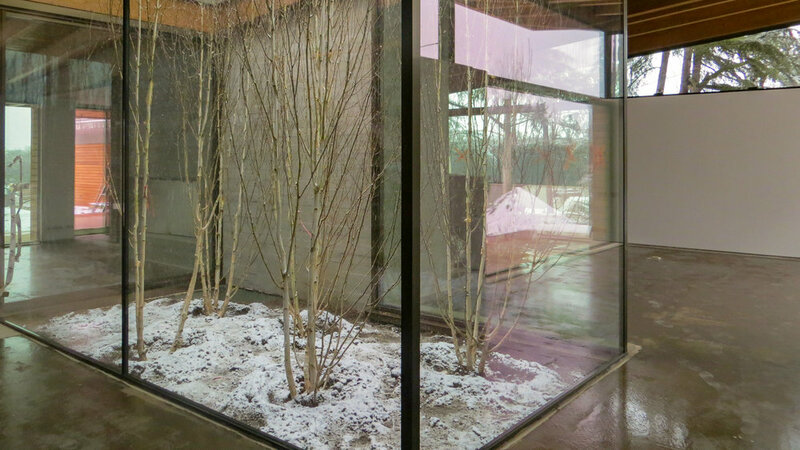 Not very often the building architecture allows us to create a garden inside, we were able to bring a piece of nature directly to this living room, open to the sky to let the snow and sun to come inside the house. The snow is covering the floor of the interior garden. We love a good statement, and a mural wallpaper offers you an excellent way to add volume and color to a room without taking physical space. These three are from Wall & Deco, one of our favorite brands, and we love the great variety of natural patterns and the vinyl quality that allows us to use them in wet areas. Branches over a dark background for this master bathroom. White and black to make a nice contrast with the white cabinets from our kitchen remodel. Sepia poppies creating volume on the back of the pink cabinets. Some views don’t need any extra addition, you can have all the plants you want inside, but the window views are what draws the most attention. Kitchen nook in Hillsborough, all the three sides are windows from ceiling to floor. The big opening to the garden is the unique painting this foyer needs. Sofas Ravel by Patricia Urquiola for B&B Italia. We created a pocket corner in the master bedroom that opens to the garden.